Gastroschisis is a malformation of the anterior abdominal wall that consists of a right paraumbilical defect with bowel loops bathed in the amniotic fluid. The prognosis relies mainly on morbidity attributable to intrauterine bowel loss or postpartum bowel dysfunction. The purpose of this study was to evaluate a potential role for fetoscopic surgery in severely affected fetuses with this condition. Employing fetoscopy, we created a laparoschisis model in eight fetal sheep between 74–92 days of gestation; median 86.5 days). Twenty to 31 days after fetoscopic creation of fetal laparoschisis, a second procedure was scheduled in six survivors of the first surgery with the goal of assessing the potential for fetoscopic intervention in this condition. In the six survivors, macroscopic intestinal changes achieved by this animal model resembled those of human fetuses with gastroschisis. Whereas fetoscopic enlargement of the defect within the abdominal wall was feasible, in none of the fetuses was return of herniated abdominal viscera followed by abdominal closure possible using fetoscopic instrumentation. Furthermore, any attempt to return the herniated viscera into the fetal abdomen resulted in immediate and severe hemodynamic compromise of the fetoplacental circulation by stretching of the intra-abdominal umbilical arteries and vein. Minimally invasive fetoscopic enlargement of the defect within the abdominal wall is feasible in sheep fetuses with iatrogenic laparoschisis. This approach might benefit human fetuses with gastroschisis considered at high risk for bowel loss by constriction at the defect site. 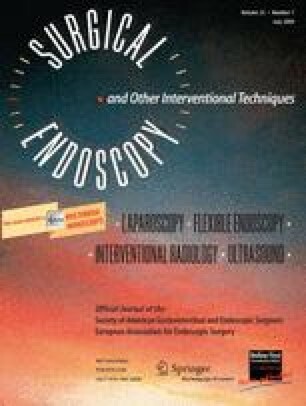 In contrast, return of herniated abdominal viscera followed by abdominal closure is limited by physiological constraints and seems currently not feasible with current fetoscopic instrumentation. The development of the minimally invasive strategies and techniques that allowed creating this animal model has been supported by educational and research grants (Ko 1484/1-1, Ko 1484/2-1, Ko 1484/3-1, Ko 1484/3-2, Ko 1484/3-3) of the Deutsche Forschungsgemeinschaft (DFG), Bonn/Germany.